For many Montreal Canadiens fans, the only reason the end of the season can’t come fast enough is that the team has much further to tank and fall in the standings. Meanwhile, for some Montreal Canadiens specifically, it’s still very much an audition process for next season. Here are five other reasons to keep watching the Habs fumble their way to the finish line. The pool of players to choose from for this list is much longer than many would expect. It includes the likes of Mike Brown (fourth-line grinder; didn’t make the cut) and Daniel Carr (fearless scoring winger who’s currently injured and technically can’t be watched). Also included is Mike Condon, the current starting goalie who might have flown under everyone’s radar due to the reason he’s been so essential to (whatever) success the Habs have enjoyed this season. The winner of the Molson Cup for January and February as the team’s best player, Condon has posted mediocre numbers overall this season, with a 2.58 goals-against average and .905 save percentage. Nevertheless, one mustn’t forget he was a backup thrust into the starter’s role and he performed admirably early on, jumping out to a 9-2-3 record before it eventually slipped to today’s 17-20-6. Condon might not be a future No. 1 in the league, but he definitely has one as an above-average backup as long as he’s not overworked. A healthy Carey Price next season is as close to a guarantee as you can get that he won’t be. 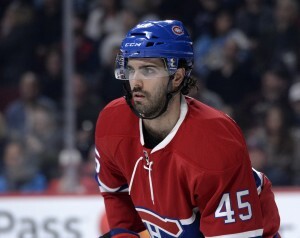 One of two former first-round picks acquired by general manager Marc Bergevin at the trade deadline (Stefan Matteau; 29th overall, 2012), Phillip Danault (26th overall, 2011) promises to get his fair share of ice time under head coach Michel Therrien. Granted, Therrien’s future with the club is about as certain as the weather forecast two weeks from now, in late March. However, Danault’s safe, responsible defensive play should endear himself to the team’s coach next season, whoever that may be. With Montreal, he also has half the offensive output (one goal, one assist) of Tomas Fleischmann and Dale Weise combined with the Chicago Blackhawks. As both are set to be unrestricted free agents, that makes Danault and the second-round pick the Habs also acquired in the deal quite the steal. While defenseman Mark Barberio’s deal expires at the end of the season, re-signing him should be a no-brainer for Bergevin. Essentially discarded by the Tampa Bay Lightning, Barberio has been a garage-sale find by the Habs and figures to be a great puck-moving depth defenseman for this team for many years to come. Sure, he’s due for a raise from the $600,000 he made last year, but not so much that it should rival the contract of say, Alexei Emelin, with whom he should theoretically be fighting for ice time in the coming seasons, due to the caliber of his play. His nine points so far (28 games) would put him on pace for nearly 30 over a full season, which is more impressive when you consider he’s getting the fifth-most amount of power-play ice time among defensemen (46 seconds per game; 16th-most overall). Needless to say, Habs fans should be seeing much more of him on the man advantage and in general from this point on. It remains to be seen if Charles Hudon will get much ice time with his recent call-up, just this past Friday. He did play 14:26 against the Minnesota Wild on Saturday, which is a good sign, hopefully of things to come. He would deserve it, based not only on his Quebec Major Junior Hockey League pedigree that led to him being drafted by the Habs (2012; 122nd overall), but also the success he’s found in the minors. He’s had two consecutive years as the American Hockey League affiliate’s second-leading scorer (top goal-scorer this season; 20). This is his second call-up this season, with him earning two assists in two games the last time around. He was held pointless against the Wild despite the increase in ice time. There’s a good chance there won’t be a third call-up, but only in the sense that he could be staying… for good. At 6’6”, 236 pounds, Michael McCarron is hard to miss. He’s also a can’t-miss prospect, while his size is currently creating a potential logjam at center, where he has regularly slotted in for Montreal in his 10 games as a Hab and Alex Galchenyuk has started carving out his niche. Things could get interesting once David Desharnais returns from injury. 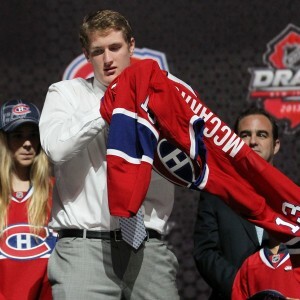 While the smart money is on McCarron shifting to the wing—the position he played when drafted—or being demoted as the odd man out, McCarron will nevertheless remain a focal point for fans and the Canadiens alike. With only one assist so far this season, McCarron, who was drafted 25th overall in 2013, remains a bit of a project. He still holds a lot of promise as an impact player, which his 15 goals and 24 assists in 54 AHL games this season as a rookie would indicate. Injuries may have forced Montreal’s hand and him into the Habs lineup, but his combination of size and skill should keep him there, even if only eventually. Consider the rest of the season a sneak preview of what McCarron has in store.